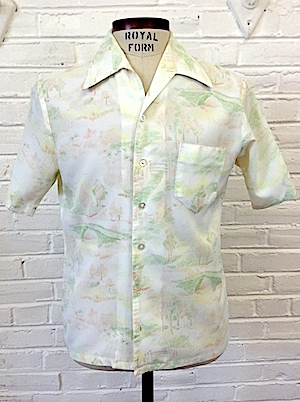 Mens Vintage 1970's DISCO Shirt! White base with shades of Green, Yellowish-Green, Brown, and Tan in a faint, impressionistic portrait of a rural countryside with a little bridge, some trees, some shrubbery, and an open field. Quaintly funky! Six Pearly plastic buttons down the front with one patch pocket on the left chest. 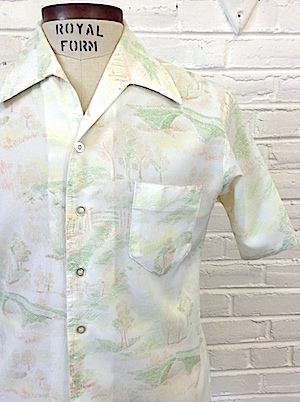 Straight hem with a long, pointy 1970's collar. Tagged by Catalina Associates, Los Angeles, CA. No material tag, but feels like a more-polyester-than-cotton blend. Chest: 39" SMALL. Boxy cut.